Cartoon by Omar Momani, used with permission. The essay below was written by Aleksandr, a contestant from Russia. Originally submitted in Russian, the essay was translated and edited by Global Voices author and translator Joel Gilbourd. Enjoy! The Internet is the most powerful and effective decentralized means of communication available today. Nothing else better embodies modern-day freedom of speech. With interests that don't always dovetail with free speech, governments throughout the world not infrequently place limits on the Web. In the Russian Federation (my country), state interference online is growing worse, thanks in part to organizations like the Safe Internet League, Roskomnadzor (the state-run media watchdog), and the Russian Union of Right-Holders. One of the next big steps in Russian Internet censorship was Federal Law 97 in May 2014, known informally as the “Law on Bloggers.” This legislation empowered the state to register any websites with more than 3,000 daily visitors in an official registry. The law poorly defines the term “blogger,” applying the term to individuals and legal entities alike. The law also challenges online privacy and anonymity, requiring the owners of websites to display their real names and email addresses. As is typical, the law says nothing about bloggers’ rights; it only imposes new obligations and penalties on Internet users. It's unclear what logic has guided Roskomnadzor in registering the bloggers it has so far, raising concerns that the process is politicized. Federal Law 187 is another piece of legislation that targets Russia’s online community. An anti-piracy bill designed to regulate the licensing of Web content, it was initially supposed to allow the authorities to block websites containing any kind of unlicensed content. Following a mass protest by Russian Web users (100,000 of whom signed a petition against the law) and Internet companies like Yandex, Rambler, and Mail.Ru, however, the legislation was first limited to cover only video content. Nevertheless, the parliament never dropped the idea, later adopting reforms in November 2014, which will take effect in May 2015. These amendments will expand the law's applicability to virtually all kinds of intellectual property (with the exception of photographs), and empower the authorities to block websites indefinitely after two complaints by copyright holders. Officials will also gain the right to block network addresses associated with others who violate of the new law. These developments threaten the Russian Internet because current Internet technology allows several sites to operate via the same network address. So, if authorities block a network address associated with a pirate Web resource, this can inadvertently block innocent resources that have not been distributing pirated content. The authorities’ newfound power to block websites indefinitely is also concerning. This seems an excessively harsh, irrational way of safeguarding the exclusive rights of copyright holders, especially given the high probability that innocent websites will be affected inadvertently. 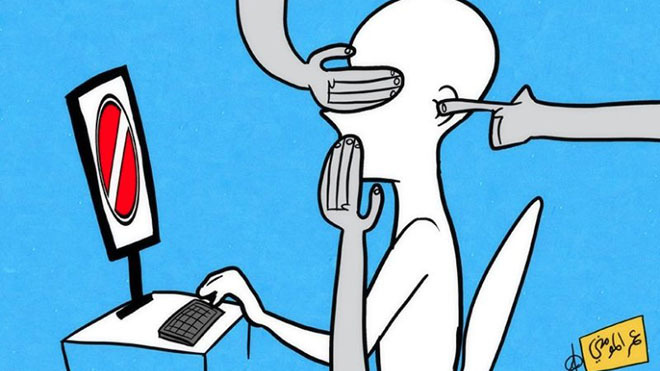 For these reasons, Russia's new anti-piracy law is an extremely repressive measure. Its heavy-handed approach can hardly be justified and its implementation is sure to harm Internet users, Web-resource operators, and even ordinary Web content distributors. In addition to the laws already on the books restricting Russians’ open access to information, there are plans to implement additions regulations that will only expand Internet censorship and aggravate the crackdown on free speech. The most significant of the new proposed measures might be the adoption, on the initiative of the Safe Internet League, of a new law that would require mandatory filtering of all Web content at the ISP level. If this law is passed, all the Web pages requested by Russian Internet users would need to be checked, in real-time, for any illicit content. This, in turn, would have several negative effects: first, there would be a catastrophic impact on Internet connection speeds; second, according to estimates, it would cost ISPs several billions of dollars to install the necessary filtration software; and finally, as the filters would allow users to only access resources which have been included in government-sanctioned “white lists,” their introduction would make Internet censorship a blatant reality in Russia. Additionally, the Safe Internet League is currently considering a project to disconnect educational institutions from the Internet and to establish special educational portals. This, too, would contravene the Russian Constitution. The Russian Union of Rights-Holders has also been developing new projects. Its representatives want to see the introduction of a licensing scheme under which ISPs would be required to pay a fixed fee in exchange for a so-called “global license.” The “Internet tax” would then flow back to copyright holders as royalty payments. Under this scheme, Web users would be given unlimited access to any content provided by a license-holder who has presented their license to the network operator. This measure would have a negative impact on ISPs, if they find themselves unable to reach an appropriate agreement with copyright-holders. Without such an agreement, the price of Internet services would skyrocket and become unaffordable for many. Russia is in the midst of a clear and undeniable Internet crackdown. Justified on the premise of protecting children from dangerous information, the government's recent policies—developed by a network of private organizations and federal police—are a blunt, ineffective approach to dealing with the Internet that alienates the chief stakeholders and users alike. The lack of consultation with the most important groups online in Russia hasn't helped anything. As a result, Russia has been left with a set of irrational policies which are out of touch with today’s realities. I hope that this essay, and the Global Voices 2015 project more generally, will help my country establish a constructive dialogue with Internet users and make fair Internet-related policy decisions in the future.